For Valentine's Day this year, I bought Ancestry DNA kits for my husband Trent and I. We had heard about them before, and it seems like they're becoming more popular these days. It's an at-home DNA kit that you can order online, they ship it to you, and you send a saliva sample back. In 4-6 weeks, you receive your results, which give you clues about your heritage. Trent has always wondered where his ancestors came from, since his dad's side is a little foggy in places. So I thought this would be a cool gift to give him - maybe it would help lead to some answers about where his ancestors were from. We waited what seemed like forever for our results, but we sent them in at the end of February, and got them back on Easter Sunday, so it only took a total of about 4 weeks to get the results. 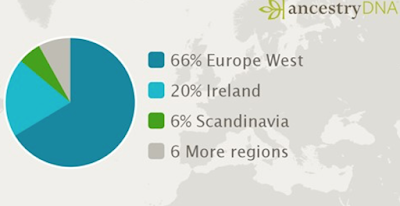 I've been told for a long time that my heritage is pretty much all European, most being Irish and German. I'm not entirely sure how the DNA test results are found or how it works, but I was a little surprised when I got my results. They were not really what I had expected to see - and neither were Trent's. I was quite surprised, to say the least, at how much it matched with Great Britain! 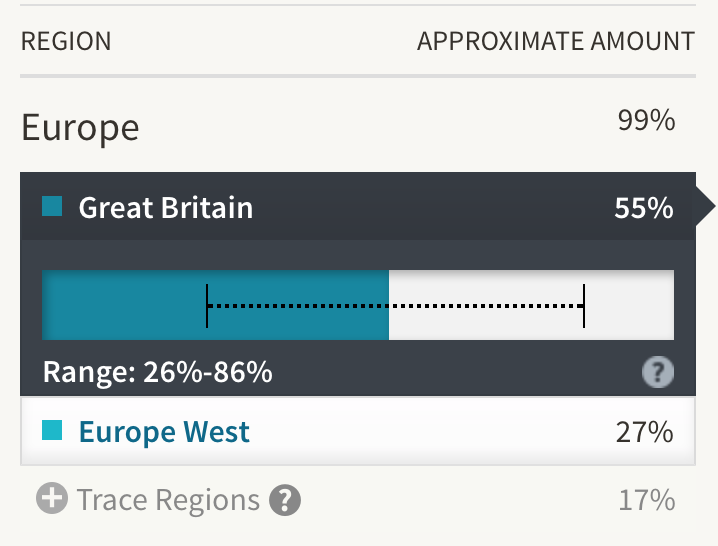 Does this mean when I thought I had mostly Irish and German heritage this entire time, I was actually mostly of British descent? What I thought would give me answers, just left me a little more confused. Looking at the map that tells me the countries I matched closest with, I saw that Germany was entirely covered, which makes sense, but Ireland is not even on the spectrum. 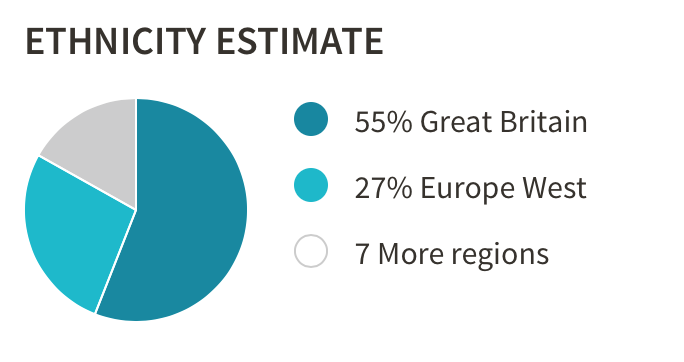 I matched 99% with Europe as a whole, but Great Britain was the strongest range of all of the countries listed. 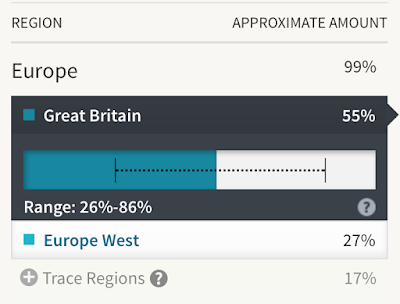 "Europe West" was my second strongest match behind Great Britain. This covers countries like France, Germany, The Netherlands, and Switzerland. Below that it listed all of the "Trace Regions" I matched with. Ireland only took 3%! 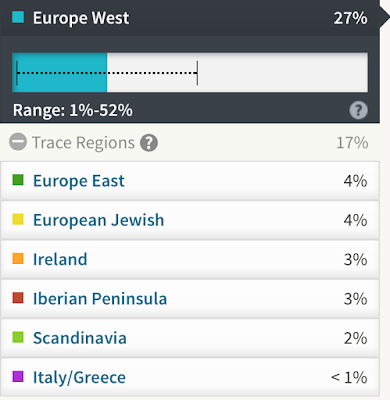 Getting these answers made me want to research more into my family history and where my ancestors originated. I subscribed to Ancestry.com this month to start building my family tree and maybe fill in some more blanks! So in my spare time, I've been delving into genealogy a little bit. It's actually pretty interesting, but not easy. There are way too many records out there to search through! It could take a lifetime just to find all of the answers. 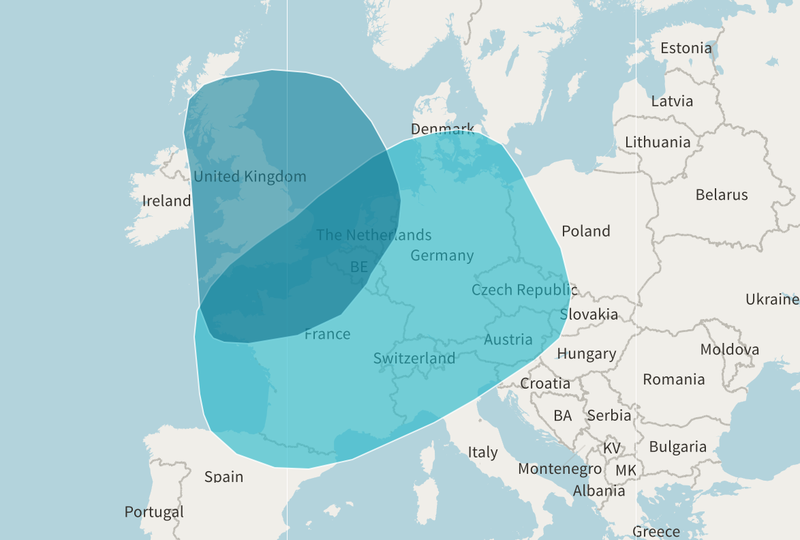 Trent's DNA test was also surprising, as even though he knew his mom's side was Welsh / European, he had always thought he had some strong Native American heritage on his Dad's side. So I guess you never know what you will find when you take these. What would be interesting to see is how our relatives match with us. That could help fill some blanks, too. Anyone else ever taken one of these tests? How did they match up with your expectations? This is so cool. I only used Ancestry.com to look records of my family and create a family tree but have seen the ad for this DNA test. I know another person that did it who was adopted and wanted to find out more about herself. She had nothing to compare it to so who knows how accurate hers was but its really fun to see what they come up with. Exactly, when I first heard about this I knew we had to do it!! I just found the results to be really different than what I was expecting! It makes you wonder just how accurate the tests are, or maybe there are just answers that still need to be found in our family history! Either way, pretty interesting, right?